Do you currently carry a Capital One credit card and own a smartphone or tablet, such as an iPhone, iPad, or Android device? In short, these deals, which are apparently available to “select card customers,” allow cardmembers to save money at various stores and/or online automatically. At the moment, Capital One has selected certain credit card accounts to participate in the program, though they plan to expand the program to more users in coming months. 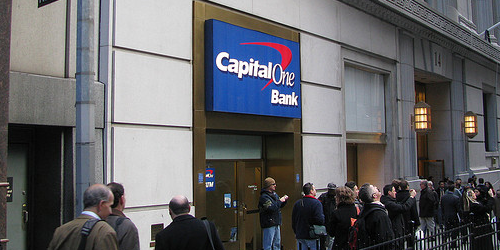 *Either way, your account must be in good standing to take advantage of the Capital One Deals program. If you’re included in the initial launch, you should see a tab titled “Deals” at the top of the app, which will list all available deals, along with your deals history. If you take a look at the screenshot above, you’ll notice a variety of offers that are preloaded onto my credit card account. Apparently they’re personalized just for me, seemingly based on my spending habits. So all I have to do in order to take advantage is shop at the mentioned stores (or websites), spend the minimum amount, and I’ll receive the discount. 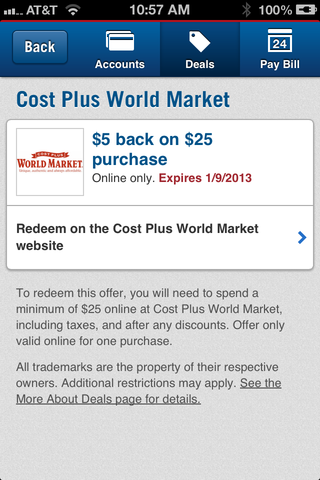 There’s no need to sign up, clip coupons, or follow any other redemption instructions; it’s all automated and it’s free! Once you take advantage of any of the Capital One Deals in your account, a statement credit should appear in roughly 10 days. Capital One also offers so-called “Featured Deals,” which they refer to as a “FreeMonee Gift” that come with no minimum spending requirement. In other words, you get a free dollar amount to spend at the merchant, and it doesn’t all need to be used in one shot (just by the time it expires). I haven’t come across one yet, but I’ll keep my eyes peeled on that front. Also keep in mind that new Capital One Deals are available weekly, so be sure to check your app each week to ensure you don’t miss anything. 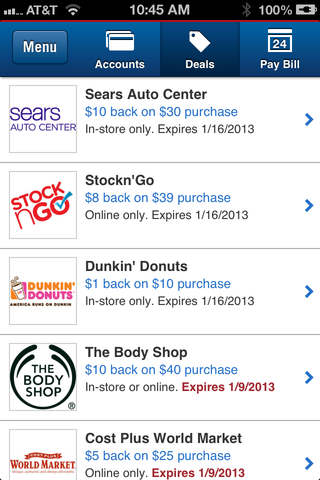 Capital One isn’t the only credit card issuer offering special deals to customers in an effort to boost card spending. American Express users now have the ability to “sync” their credit cards via Twitter, Facebook, or Foursquare to receive similar deals that are credited to their accounts automatically. There’s also BankAmeriDeals, which are offered to Bank of America credit and debit card users. If you’re a cardholder of any of the aforementioned companies, you should at least check out of the deals to see if any can save you some money.